Living in the mountains for almost 20 years, and I still find new spots to share, like these Wildflower Fields on Peak 7 in Breckenridge, a suggested Photo Shoot Location. Now, mind you this land traverses next to private property and is in a pretty secluded neighborhood, this area is meant for small groups, preferably less than 10 at a time. Just schedule the photographer and the bride and groom for a half hour on the trail near the Breckenridge Ski Resort. I've included a map below to show you where it's at. 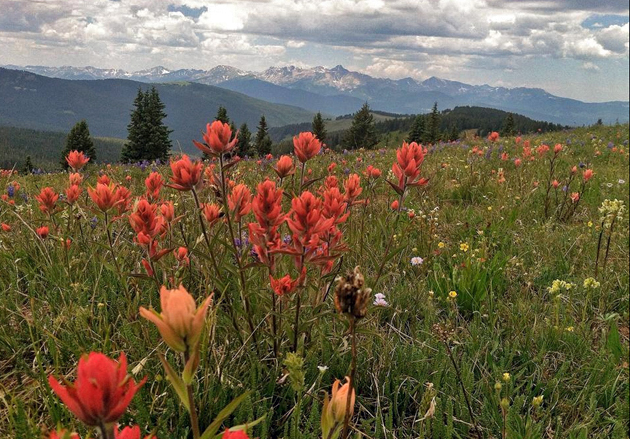 For a list of other recommended hikes near Breckenridge, click here to read a blog on The Flower Maven. Don't worry if you can't make it to this exact spot for your wedding photos on the big day. These flowers won't last forever, but the mountain vistas will. And these flowers come from long winter weathers and heavy snowfalls. Summer or Winter, then? You have your choice of seasons, and whether or not you want a white winter backdrop instead of colorful wildflowers. But, consider this are surrounded by world-class ski areas like Vail, Beaver Creek, Copper Mountain, Keystone and A-Basin. A winter wedding proposal can be a fun experience, and if you need some help to put all the pieces together on the sly, we're good at personalizing elopements and small vow renewals that are similar in intimacy. Please be respectful of parking and don't step on the wildflowers. Tread lightly and please Leave No Trace when traveling in the mountains. The hike its about 7 miles round trip. If you take my advice about driving all the way to the top you will be cutting out about 4 miles all together. On the day we decided to hike up a bad thunderstorm came through quickly. As soon as we got to the Upper Lake we had to high tail it back down. With that said, it would be a good idea to bring a rain jacket! This is the view from the upper lake to the lower lake. Totally worth it to keep going once you get to the lower lake. We had to stop at the Continental Falls on our way back down. I think this picture needs to be in a Scott Fly Rods ad! Here's me attempting to catch one of those Brooke Trout that I could see sipping right on top of the water. He was more successful at catching the fish than I was. All of the lakes off the trail are fishable. I've seen Cutbows and Brooke trout caught right out of the alpine lakes. A camera is a must-bring-item on this adventure. You may come across mountain goats like I did! Wildflowers and wildlife abound around the lakes. During this time of year (Late July- Early August) the wildflowers are hitting their peak right along the trails. The trail system near Breckenridge is an absolutely amazing connection of old mining roads and singletrack that travels through the trees and hillsides. Some trails, like the Minnie Mine, has lots of old mining structures that you can look at, while trying to imagine this place during the gold rush. There's even a dredge boat they plan to restore in a pond on the south side of the loop we do. We connect with the "bomber trail" or the B&B trail, according to the sign. Lots of variations exist in this area, please take a map, and share your pics with us!